In 26 years as a theatre professional, Ralph Elias has directed across the U.S. and in the Russian Far-East, has acted on the stages of leading regional theatres and in New York City, and has taught acting as an artist-in-residence with several prominent university theatre programs. He continues to perform, despite having directed 30 productions since 1988. Ralph appeared as both Dukes in As You Like It for The Shakespeare Project in 2001, as Dr. Prentice in Joe Orton's What The Butler Saw in 2000, and in the 1994 American premiere of Alan Ayckbourn's Mr. A's Amazing Maze Plays at San Diego's Old Globe. Early credits include a season with Washington DC's Arena Stage , where he performed opposite Dianne Wiest in The Dybbuk and with Robert Prosky in Death of A Salesman. From 1988 to 1995, Mr. Elias was Artistic Director of Blackfriars Theatre of San Diego, a company described by that city's Commission for Arts and Culture as "a San Diego treasure." He directed 14 Blackfriars productions, including highly acclaimed stagings of John Patrick Shanley's Danny and the Deep Blue Sea, Isaac Bashevis Singer's Teibele and Her Demon, Sam Shepard's The Unseen Hand, and the west coast professional premiere of Gilles Sègal's The Puppetmaster of Lodz. He also played Algernon in The Importance of Being Earnest, Bobby Gould in Speed-the-Plow, and Lord Byron in Bloody Poetry. His production of Beth Henley's feminist western Abundance, described by the Pulitzer Prize-winning playwright as "beautifully and bravely directed," toured Far-Eastern Russia in 1993 - the first appearance by American performers in that region's history. In 1994, Mr. Elias received an Arts America grant to stage Tennessee Williams' Summer and Smoke for the internationally renowned Maxim Gorky Theatre of Vladivostok; a huge hit with Russian audiences, it was matched by a 1988 production of Henley's Crimes of the Heart. Most recently, Ralph directed seven productions in Florida, including Arthur Miller's The Ride Down Mt. 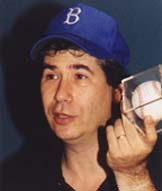 Morgan, for the Red Barn Theatre of Key West in 2001. A University of Maryland graduate, his M.A. in the Contemporary Practice of Shakespearian Theatre was earned in England, at the University of Essex.